Al Veilleux started the Dan Coady Jr. Memorial Scholarship for a student who attended Thomson Grammar School in North Andover where Dan Coady’s children go to school now. To his right are Mike Memmola, Tasha Kinsman Ryan, and North Andover Town Moderator Mark DiSalvo also donated to the Coady scholarship. FIREFIGHTERS RELIEF’S IN, 1 MARKET ST, LAWRENCE. Jamie Plodzik and Camey Adams recipients of the 1st Dan Coady Jr. Memorial Scholarship with Pina Prinzivalli in the background. 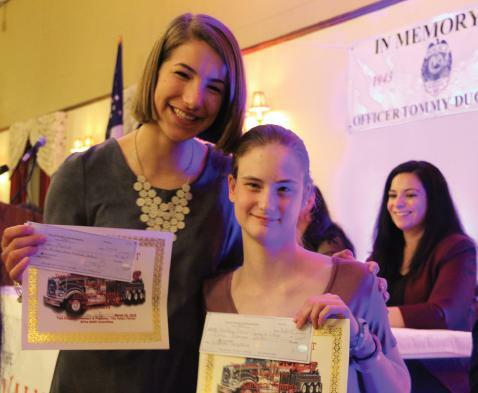 Valley Patriot publisher told the attendees of the 14th Anniversary BASH last month how the Dan Coady Memorial Scholarship came to be. “As I said earlier, our good friend Al Veilleux donated $300 to our scholarship for a Whittier Tech graduate this year, but when he came by with a check he said he wanted to start off a scholarship in memory of Dan Coady Jr. who was tragically killed last week on Route 495 working for Coady’s Towing Company. So, he pulled out a check and gave us a check for $500 to start a scholarship for a kid in Dan Coady’s name. So, I went on line and thanked Al Veilleux for his donation and as is always the case with Valley Patriot readers and supporters, you guys stepped up and said you wanted to give more. SO when all of that was done where people were trying to outbid each other on my Facebook page to donate to this scholarship – believe it or not we have never given away this much money at any BASH ever – as of this minute we have raised $3,700 for the Dan Coady Jr. Memorial Scholarship. Our first scholarship is going to go to somebody special, Camrey Adams for $1,000. One of the things that Al Veilleux asked as a requirement for the recipient of this scholarship is that the student who wins should have gone to Thomson Grammar School because that’s where Dan Coady’s kids go now and someday maybe they will get this scholarship. Camrey Adams attended Thomson Elementary School, the Kittredge Elementary, the Middle School and finally North Andover High School. She’s a member of the Best Buddies Program, Special Olympics Basketball and Gymnastics, the North Andover Youth Center, and the High School Chorus. She volunteers whenever possible behind the scenes at various NAHS events including this year’s Mr. North Andover and Coffee House’s, tutors a fellow special needs class and whenever possible helps her fellow special needs friends get to class and around school. She’s dating one of her best friends, Will, with whom she’s been friends with since 6th grade. She went from doing Alt-MCAS at NAMS to taking and passing the regular MCAS testing to qualify for graduation with her class of 2018! Our second Dan Coady Memorial Scholarship winner is North Andover High Senior Jamie Plodzik for $2,700. Jamie is a senior at North Andover High, attended the Thomson and is very involved with community service, school events, and sports. She played volleyball and decided to change her athletic focus towards long distance running. She was indoor Track Captain this year for the girls team, has been part of the Cross Country and Track/Field Program for the past 3 years. Her main event is the 2 mile, in which she qualified for states this past winter with a personal record of 12:06. She also was awarded MVP this year for Girls Cross Country. Jamie says her interest in running led her to want to pursue an education in nutrition, dietetics and food sciences in order to become a registered dietitian. She has been involved in concert choir in high school all 4 years, has been a member of National Honors Society since her junior year and volunteers for the Special Olympics Basketball team. Jamie loves working with special needs kids, which makes her perfect for this scholarship as our first winner is a special needs student! Last February, Jamie went on a week-long service trip to the Dominican Republic to volunteer at local environmental centers and a girl’s recreation center. She is in AP Spanish and has been a student chairperson for the Massachusetts Breast Cancer Coalition for the past two years and helps organize events for it on the Cape and fundraise money. Jamie is deciding between the University of Vermont and Virginia Tech for a Nutrition/Dietetics major. Tasha herself was in a terrible car accident a few years ago and almost didn’t make it. She called us and said that the Coady Family was so good to her after her accident, driving her workers to and from work, and when she got out of the hospital Frank Coady, who had towed her car the night of the accident, didn’t charge her for towing or storage while she was in the hospital. Tarsha says she wanted to give $100 for each year since her accident so tonight she donated $800. Donating to this scholarship were: Myles and Patricia Burke $100, Kevin Leach-Essex Education Foundation $100, Marc DiSalvo $100, Cynthia Aziz Kannan $100, Francisco Paulino $150, Martineau’s Towing $250, Al Veilleux $500, Mike Buco and Sons Construction $500, Joe Viel $500, Mammola Electric $500, Methuen City Councilor Jen Kannan $100.00, and a special donation by Tasha Raye Kinsman Ryan of $800 bringing our total to $3,700 total for both of these scholarship recipients. Both Al Veilleux and reader Ken Deluca pledged $500 each for next year’s Dan Coady, Jr. Scholarship.